Undergraduate students can pursue three-dimensional study in sculpture at Lamar University through the Bachelor of Fine Arts degree in Studio Art by declaring a concentration in Sculpture. Lamar University students pursuing a concentration in sculpture develop an understanding of basic design principles, concepts, media, and formats throughout the course of their study beginning with their foundation studies. Students are required to develop original solutions to aesthetic and design problems throughout the degree program. Sculpture students develop knowledge and skills in the use of basic tools, techniques, and processes sufficient to work from concept to finished product including direct instruction in the basic materials and technical procedures used in additive, subtractive, substitution, wood construction, metal fabrication, mold making, and casting processes. Advanced students explore performance, installation and public art while developing a personal aesthetic based on individual strengths and interests. Lamar University sculpture students have monitored access to materials, equipment, and library resources related to the study of sculpture. The Sculpture area promotes communication between students in all levels with critiques, presentations, and mentorship. Students pursuing a Bachelor of Fine Arts degree with a concentration in Sculpture are required to take introductory courses in Ceramics, Painting, Printmaking, and Photography. The undergraduate sculpture curriculum culminates in Lamar’s distinctive senior thesis program involving a series of original works produced by each Bachelor of Fine Arts degree candidate, exhibited in the Dishman Art Museum, and defended by the student in a formal written thesis. The sculpture area includes 5, fully equipped and well-maintained facilities for wood, metal fabrication, cast metal, ceramic shell, and mold making. Students learn how to safely operate equipment and to use a range of hand tools while creating their personal vision. Our sculpture faculty challenge students to build both a strong technical and conceptual understanding along with a working knowledge of contemporary art and issues from which to work. Wood Studio: equipped with basic hand tools, power tools, and stationary tools (drill press, band saw, miter saw, circular sander, belt sander, panel saw, table saw). 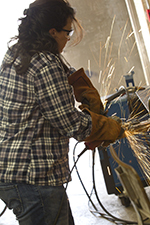 Metal Studio: equipped with oxy-acetylene torch, plasma cutter, mig welder, and cutoff saw, and numerous hand tools. Foundry: equipped with a #70 crucible furnace, cupola furnaces, mixer for sand molds, and overhead crane. Ceramic Shell Studio: equipped with industrial slurry mixer and facilities for wax working and wax burnout. Mold Making Studio: equipped to produce multiple forms in plastic, rubber, foam, plaster and wax. Student engagement outside the classroom is encouraged through internships, participation in regional and national conferences, and opportunities for employment. Examples include assisting professional artists for the Keen Foundry Invitational Symposium and assisting sculpture professors with iron pours at the Sculpture Network of Texas and the National Conference of Cast Metal Sculpture. 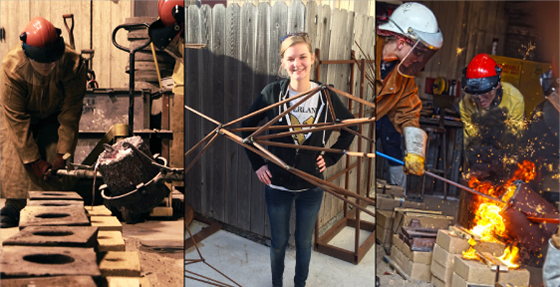 Students also have opportunities to produce and exhibit sculpture coordinated by the Texas Atomic Iron Commission. Opportunities of this nature frequently takes place every semester. Students concentrating in sculpture also have the opportunity to participate in student-run organizations that include Artist Common, Sol Gallery, and Feldspar. There is no concentration in ceramics offered at this time. However, multiple course levels are offered in ceramics, offering the opportunity to enhance other concentrations in Studio Art and students may elect to include clay as a material in combination with other media in their Senior Thesis. Ceramics courses allow students to investigate a variety of clay bodies, glaze chemistry, building techniques, wheel thrown forms, and various firing techniques. Ceramic courses are intended to encourage students to explore individual expression and critical thinking skills. The ceramics facilities include a classroom, a glazing room and a kiln room. The classroom includes a number of ceramic wheels, a slab roller, table space for hand building, and exceptional storage space for drying purposes. The kiln room includes a walk-in Alpine kiln, a salt fire kiln, and a number of smaller kilns. Utilizing a ceramic studio with large-capacity kilns allows for the firing of earthenware, stoneware and porcelain temperatures with raku, standard low fire, stoneware feldspathic glazes and sodium-vapor glazing. Feldspar is the Department of Art's ceramics club. They promote awareness of the art of ceramics, and raise funds for the Southeast Texas Foodbank by participating in the Empty Bowls Project.